No governmental agencies in the U.S. or abroad are tracking the whereabouts of people after they’re deported, says New Comienzos founder Israel Concha. MEXICO CITY — In the area known as Little Los Angeles, in the Tabacalera neighborhood of Mexico City, some passersby may not know what goes on in the nondescript white building where many binationals — as repatriated Mexicans deported from the U.S. refer to themselves — are working in call centers, adjusting to new surroundings and struggling to rebuild their lives. For these recent deportees, who have long been under the gaze of people and groups — whether it's ICE or the U.S. Border Patrol, criminal groups or even fellow Mexicans — it’s easy to see how anonymity might feel welcome. This makes the radical openness of someone like Israel Concha — a former deportee himself — magnetic and slightly subversive but vital. He thinks that Mexicans who have spent time in the U.S. bring crucial skills back to their home country and should be an integral part of society. Concha, 38, is the president of New Comienzos, a nonprofit that helps Mexicans recently deported from the U.S. get back on their feet. Founded in January 2015, New Comienzos works in most states across Mexico and has helped over 5,000 deportees adapt to returning home, search for employment, find access to legal and psychological help, and get accreditations in both English and Spanish through government sponsors and the help of VIRAL, an internet youth platform aimed at facilitating community projects. Mexico has a federal program, Somos Mexicanos, founded in 2014 and with a presence in all 32 Mexican states; it was created to aid in the social and economic reintegration of repatriated Mexicans. But New Comienzos is arguably on the vanguard when it comes to helping those who were sent back navigate crucial issues beyond jobs and housing — such as sexual assault, bullying and discrimination. 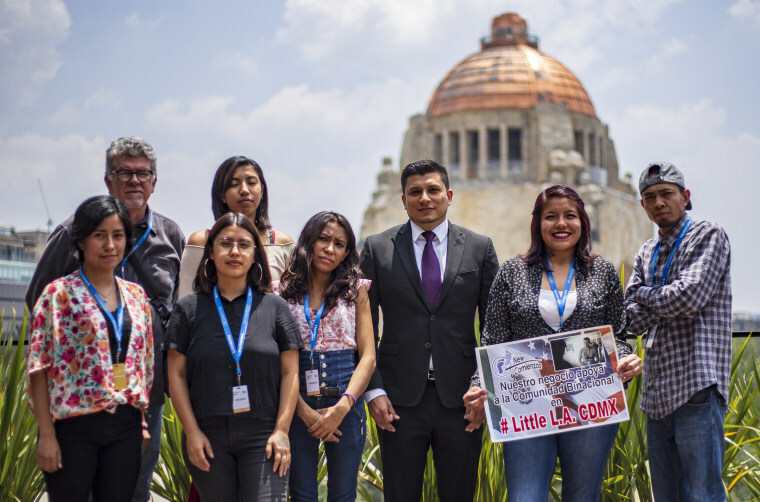 It's not uncommon for the Mexican government to reach out to New Comienzos as they and organizations like the Instituto Nacional de Migració find themselves bracing for a surge of repatriated Mexicans in the wake of the Trump administration’s deportation policy. Concha was brought by relatives to the U.S. when he was 2; the family stayed in the country when its tourist visa expired. Concha obtained a business degree from the University of Texas-San Antonio but couldn't find work because of his undocumented status. So he started his own business, American Yellow Cab, which offered limo, cab, shuttle and rental car services and employed more than 30 Americans. But then he was stopped for speeding, which led to deportation proceedings. At the time, his company was making over $300,000 in net profit a year and growing. After walking the international bridge from the U.S. into Nuevo Laredo, across the border from Laredo, Texas, in 2014, Concha was kidnapped the same day. He managed to escape and vowed from that day to use his savings to help others in the same situation. Still funded in part by Concha’s own contributions, New Comienzos is now largely funded by donations from other undocumented people living in the United States. There are 11 repatriation points across Mexico, Mexico City being one of them. Concha, along with a group of volunteers from New Comienzos, has been going every week to Terminal 2 at Mexico City's Benito Juarez International Airport to greet the approximately 150 deportees who were arriving every Tuesday, Wednesday and Thursday. They bring fresh clothes — many deportees are still wearing what they wore when they were apprehended — as well as food and the offer of any help New Comienzos can provide to those who need it. But since the end of May, it's been different. “We started noticing at the airports that the flights have been canceled," Concha said. "We know there’s clearly a problem going on." In June, Mexico's foreign secretary, Luis Videgaray, said that the Trump administration had halted flights to Mexico City in an effort to focus resources on the repatriation of Central American migrants. An official from ICE told NBC News in a statement on July 31 that commercial flights taking Mexican nationals back to Mexico were still being conducted, and that, as of July 23, the agency had flown 112,441 Mexican nationals so far this fiscal year. The official also said that 80 percent of 128,765 removals in 2017 were by land borders, meaning that no flights were involved. According to a report in June, some shelters in the northern part of Mexico have had a steep increase in deportees; advocates say the region is more dangerous for migrants. In Mexico City, Concha said he still hasn't seen flights resume. He worries about what is happening to deportees if the repatriation process is slowed or halted. “We have family members that tell us that people are still being detained even after a deportation order by a judge,” Concha said. While Concha worries about the fate of deportees who have still not made it back to Mexico, he's also deeply immersed in his newest project: a kind of demographic research of the recently deported in Mexico City. In New Comienzos’ Silicon Valley-like co-working space, surrounded by tech entrepreneurs, freelance writers and graphic artists, he meets with volunteers and explains the study. American academics are doing part of the research and journalists have been invited to observe. No governmental agencies in the U.S. or abroad are tracking the whereabouts of people after they’re deported, explained Concha. But according to Sarah Stillman, director of the Global Migration Project at the Columbia School of Journalism, the data looks grim. Stillman’s group of graduate students track violence experienced after deportation by collecting raw data from police departments, mortuaries, law offices and shelters in Mexico and Central America. The day of the return migrant interviews, the New Comienzos’ co-working space is abuzz with activity. U.S. scholars and volunteers alike crowd a table, jockeying for a bit of Concha’s time but also for time with the interviewees themselves, who are the fresh new faces of the recently deported. Their experiences and stories have yet to be told. Volunteers are giving out coffee to the interviewees, who have been promised 300 pesos, about $15, for an hour of their time. This includes a tour of the New Comienzos work space and a battery of questions. I sit down with Angie, who is being interviewed by Dr. Anita Isaacs of Haverford College in Pennsylvania and one of Isaacs' students. Angie, 32, is a single mother; she's been back in Mexico for seven years. She lived in Plano, Texas, where she bused tables for the Mexican food chain, El Chico, and also worked as cashier for Wetzel’s Pretzels at a local mall. She was stopped while driving from Plano to Brooklyn, New York, where she was moving to be with family; her detainment and deportation lasted mere hours. She was taken to a detention facility in Buffalo, sentenced and sent on her way. Angie answers the opening questions: Why did you migrate to the United States? How old were you? How did you enter the United States? Did you apply for political asylum upon entry into the U.S.? From here, the questions get heavier: Do you feel safe in Mexico? Have you been a victim of a violent crime? Do you feel more vulnerable as a returning migrant? Have you experienced violence or discrimination in your home country? Angie admits she doesn’t feel safe in Mexico and has been the victim of several assaults since returning. But what's also making life precarious is the class-based system that bleeds into the most mundane of things. As a returning migrant, she found it difficult to find a job with her American credentials and was confronted by mountains of red tape — the translation of grades, transcripts and proof of residency — just in order to finish high school. Moreover, she found that Mexicans often bristled at her desire to pursue higher education. Now a student at Mexico’s most prestigious public institution, the National Autonomous University of Mexico, she hopes to finish her degree with the help and resources of New Comienzos. While Mexican binationals like Angie have to grapple with discrimination when they get back, it can be particularly intense for Central Americans who are either deported to Mexico from the U.S. or are passing through the country on their way to the United States. New Comienzos offers them resources as well, including legal and psychological help, shelter assistance and even access to a system of mentors to help navigate the complexities of emergency situations. As New Comienzos grows, they’re hoping to strengthen their presence in Central America to help the repatriated community there. Despite the discrimination, Angie still feels a part of the Mexican fabric. She made it a point to vote in the July 1 elections, giving her vote to President-elect Andrés Manuel López Obrador, who, in a campaign stop in Culiacán, vowed to "defend the migrants from Mexico, Central America, all the American continent and all the migrants of the world." In the past decade and under two different political parties, Mexico has grappled with wrenching violence: more than 175,000 dead, over 27,000 disappeared and dozens of journalists killed. Cartel fighting and corruption in large swaths of Mexico — from the northern regions of Tamaulipas and Nuevo León to Guerrero, parts of Jalisco, and the Estado de Mexico right outside of Mexico City — has exacerbated the plight of migrants, many of whom have a tepid relationship with Mexican authorities. Listening to Adrián talk — about wage justice, about red tape, about class struggle, about creating a Mexican fabric in which Mexicans aren’t forced to migrate north — it’s apparent that, like López Obrador, binationals want change. Time will tell if repatriated Mexicans and López Obrador's new government end up on the same page.